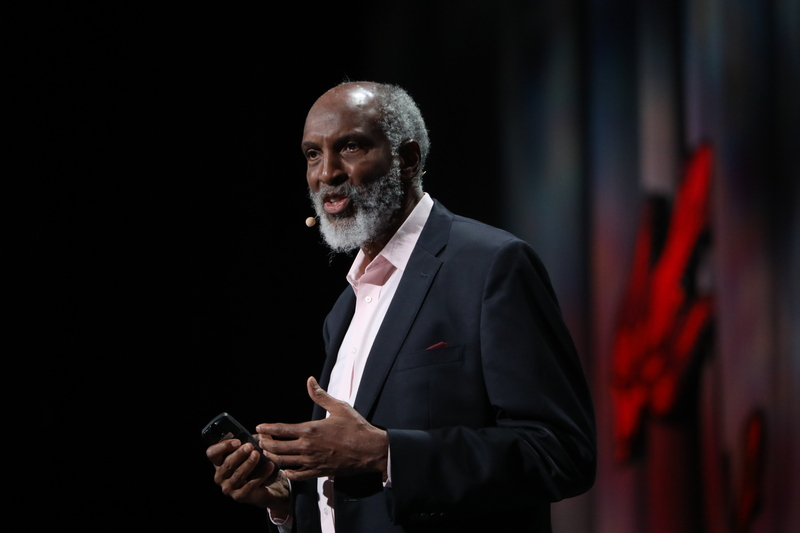 Carrying his message of belonging to the 28th Bioneers Conference in San Rafael, California, Haas Institute Director john a. powell urged an audience of hundreds of people who packed into a large auditorium to focus on compassion, our shared humanity, and reshaping structures to create spaces in which no one is left out. In a keynote address on "Co-Creating Alternative Spaces to Heal" on the last day of the three-day gathering, powell laid out the challenge before us as one of moving "from an exclusionary society, to an integrated society, to an inclusive society, to a belonging society," an admittedly difficult task considering the tense political climate and deep-seated divisions in our country. The annual conference provides a platform for progressive-minded activists, organizers, scholars, journalists, thought leaders, and others working on range of issues to share their experiences and success stories. In his talk, powell noted that demographic changes in the country where non-whites are becoming more visible creates anxiety among dominant groups. This is a natural feeling, he said, the response to which can take at least two forms. The first is "breaking" or "othering," that is, to resist this change and create an unwelcoming or hostile environment for people the dominant group views as a threat. Alternatively, the response can be one of "bridging" or "belonging," meaning to embrace those changes and form bonds with people from different backgrounds and with different views. The more common reaction to change is the former, powell added, a problem with profound consequences for our planet. "Belonging is not just how we treat each other, belonging is how do we actually organize our economy, our structures, our schools, ... where everyone belongs, and recognizing we still have differences," powell said. But recognizing our differences is not enough, he added. To move away from "breaking," we must also understand the deep connections between human beings, something that can be accomplished by focusing on empathy with others, and sharing stories of suffering. "Focus on empathy, and empathy is actually just another way of talking about love. Focus on recognizing that we are deeply related already. But how do we actually acknowledge that, not just [on a personal level], but also in our communities?" powell said. He added: "Even if people in our communities or country are acting in ways that we believe are unworthy of human beings, we must still care enough about them so that their lives and ours ... become inseparable." Pointing to the protest movement that emerged last year at the Standing Rock reservation in North Dakota last year against the proposed construction of an oil pipeline as an example of belonging, powell said more experiences like that are happening across the country and need to be given prominence. "We have to deepen those examples, we have to celebrate them, we have to talk about them," he said. "You've heard about Standing Rock. [It was] not only something important for our society, but it was about belonging. Everyone who went there came back talking about love, the sort of rainbow effect. So that's one example that belonging already happens in our society, we just have to punch it out," he said. Later in the day at the conference powell also participated in a panel on "Reclaiming Belonging: Is resistance enough?" where many of the same themes were discussed. Asked by panel facilitator Connie Cagampang Heller, the co-director of Linked Fate Fund for Justice, how to approach villains in a society built on belonging, powell said the focus must be on structures and institutions, not individuals whose actions are dictated by those structures. He provided an example from several years ago when he spoke to an audience of a couple hundred white conservatives in Alabama about the Affordable Care Act (Obamacare), and race, after being warned that the last person who tried appealing to them on those topics was booed off the stage. powell said he began his talk by asking those in the crowd who had a family member who lost their health insurance because they lost a job to stand up. After a couple more questions that showed the failures of insurance companies to provide proper care, everyone in the room was standing, he said. "I said insurance companies shouldn't be deciding your life, and that's what the Affordable Care Act is trying to fix. And as bad as it is in your community, it's worse in the Black and Latino community," powell added, saying he "didn't lose one person [in the crowd]." "A part of what I did, in terms of empathetic listening and engagement, is I got their suffering into the conversation. In this case, the villain was the insurance company. It wasn't a person, and they were fine with that. They were happy to hate the insurance companies," powell explained. powell shared the panel with participants Heather McGhee, the president of Demos, and Jonathan Smucker, the author of Hegemony How-To: A Roadmap for Radicals. For more on john's concepts of bridging and belonging, see the video below. Download john's PowerPoint presentation from the talk here.